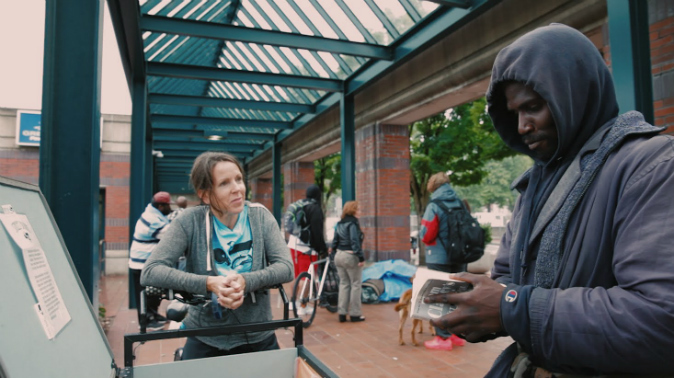 A writing professor is hoping to give homeless people in Portland, Oregon, fodder for more stimulating conversations by giving them access to literature. Laura Moulton cycles around Portland, Oregon, with her mobile library, called Street Books, every week to distribute all types of genres to over 5,000 patrons. And she’s garnering quite a reputation among the locals. Moulton said borrowing books from libraries can be extremely difficult for the homeless—they lack the required documents to get a library card, such as identification and a home address. Their everyday lives make it hard for them to return books on time, or in good condition, triggering hefty fines they cannot pay, she said. Bentley, who is a Dan Brown fan, said he loves the literature offerings. “It is knowledge and wisdom, and who wouldn’t want to be a wise man?” he said. Moulton started Street Books as a summer art project in 2011 and it has now grown to a team of seven to help peddle the books to the literary inclined. The project receives grants and book donations. At first, the naysayers doubted that the books would be returned, Moulton said on her website. If patrons can’t get hold of her, for whatever reason, she said she urges them to pass books along to someone else who might also enjoy reading it.